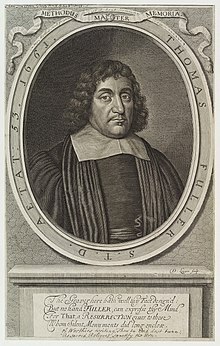 Thomas Fuller (baptized 19 June 1608 – 16 August 1661) was an English preacher, historian, and scholar. Though blood be the best sauce for victory, yet must it not be more than the meat. The History of the Holy War (1639), Book I, Ch. 24. Drawing near her death, she sent most pious thoughts as harbingers to heaven; and her soul saw a glimpse of happiness through the chinks of her sickness-broken body. Life of the Duke of Alva (1642). Compare: "A fiery soul, which, working out its way, Fretted the pigmy-body to decay, And o'er-inform'd the tenement of clay", John Dryden, Absalom and Achitophel, part i. line 156. A Pisgah Sight of Palestine (1650), Book II, ch. XI. Miracles are the swaddling-clothes of infant churches. There is a great difference between painting a face and not washing it. Church History, Book VII, Section 32. Often the cockloft is empty in those whom Nature hath built many stories high. Andronicus, or the Unfortunate Politician (1646), Sect. vi. Par. 18, 1. Compare: "My Lord St. Albans said that Nature did never put her precious jewels into a garret four stories high, and therefore that exceeding tall men had ever very empty heads", Francis Bacon, Apothegms, No. 17. The History of the Worthies of England (1662) ; Worthies of Huntingtonshire – John Yong. Many favors which God giveth us ravel out for want of hemming, through our own unthankfulness; for though prayer purchaseth blessings, giving praise doth keep the quiet possession of them. The History of the Worthies of England (1662): Musicians. One that will not plead that cause wherein his tongue must be confuted by his conscience. The True Church Antiquary. Compare: "A little philosophy inclineth man’s mind to atheism, but depth in philosophy bringeth men's minds about to religion", Francis Bacon, Of Atheism. But our captain counts the image of God—nevertheless his image—cut in ebony as if done in ivory, and in the blackest Moors he sees the representation of the King of Heaven. The lion is not so fierce as painted. Of Preferment. Compare: "is bark is worse than his bite", George Herbert, Jacula Prudentum. Their heads sometimes so little that there is no room for wit; sometimes so long that there is no wit for so much room. They that marry ancient people, merely in expectation to bury them, hang themselves in hope that one will come and cut the halter. He will make a strange combustion in the state of his soul, who at the landing of every cockboat sets the beacons on fire. Do not in an instant what an age cannot recompense. Heat of passion makes our souls to chap, and the devil creeps in at the crannies. Scoff not at the natural defects of any which are not in their power to amend. Oh 't is cruelty to beat a cripple with his own crutches. WHAT faults I correct in my son, I commit myself: I beat him for dabbling in the dirt, whilst my own soul doth wallow in sin: I beat him for crying to cut his meat yet am not myself contented with that state thy Providence hath carved unto me: I beat him for crying when he is to go to sleep, and yet I fear I myself shall cry, when thou callest me to sleep with my fathers. Alas! I am more childish than my child, and what I inflict on him, I justly deserve to receive from thee - only here is the difference: I pray and desire that my correction on my child may do him good; it is in thy power Lord, to effect, that thy correction on me shall do me good. How near was I to danger, yet escaped! I was upon the brink of the brink of it yet fell not in; they are well kept who are kept by thee. Excellent Archer! thou didst hit the mark in missing it, as meaning to fright not hurt me. Let me not now be such a fool, as to pay my thanks to blind fortune for a favor, which the eye of Providence hath bestowed upon me. Rather let the narrowness of my escape make my thankfulness to thy goodness the larger, lest my ingratitude justly cause, that whereas this arrow but hit my hat, the next pierce my head. This page was last edited on 19 January 2019, at 23:12.